Business leaders spend countless amounts of money and man hours optimizing their business’ presence online. But did you know that many of the same goals you try to achieve through SEO and social media marketing for your business can be achieved through social leadership and online reputation management? Social leadership is when leaders of a business work to establish a personal brand for themselves through social media platforms online. Their personal branding works in conjunction with larger business goals of establishing a strong company brand. Research shows that public perceptions of business leaders and executives has a strong impact on public perceptions of their company. Buzz generated from blogs, social media posts, comments, and so forth by business leaders can bleed into and influence the success of their business. In a recent blog on LinkedIn, I offered tips about how business leaders can use social media to get started on building a personal brand online. In the following discussion, I talk about the larger benefits that social leadership can have for your company. When approached strategically, social leadership can generate leads for your company, strengthen customer loyalty among your company’s target audience, build stronger connections among company leadership and employees, and generate more overall traffic to your company website and social media platforms. 1. Social leaders put a face on your organization. Putting a face on your organization will humanize your brand, and this in turn will boost your employee and customer confidence. People don’t want to interact with a faceless company or corporation. They want to know that ultimately it is a person or a group of people handling their concerns. A recent study suggests that more than 70% of U.S. customers believe a company is more trustworthy if the leaders of that company communicate on social media about the company’s mission, values, and purpose. Social leadership contributes positively to your brand’s reputation. 2. Social leaders convert actions into interactions. Brand advocacy starts from the leadership. When leaders of your organization start interacting on various social media channels, you are empowering your employees and customers to express their opinions. When leaders talk about their ideas and vision for the future, it encourages colleagues, customers, and the community to offer their feedback. These interactions will organically incorporate discussions about your company into a wider network of conversations on social media channels. 3. Social leaders attract talent and boost employee confidence. People want to work for social leaders. Employees themselves use social media and they want to see their leaders using similar communication channels. Social media opens new lines of communication for employees to connect with the leaders they work with—leaders they might not get to interact with on a daily basis except in passing. Employees want to know what their leaders are saying or thinking; they want to be inspired by their leaders. Importantly, most employees feel leaders on social media are better leaders overall. 4. Social leaders are in tune with stakeholders. 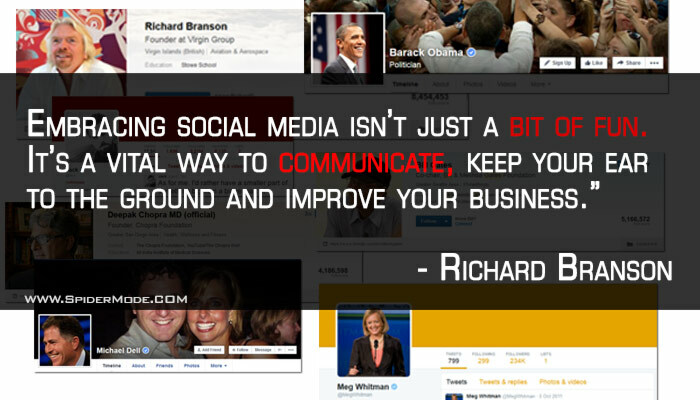 Social media is a great platform to connect with the wide network of stakeholders invested in your company’s success. As a communication channel, it allows business leaders to listen to what their target audience, investors, competitors, media outlets, and employees are saying about the company’s decisions. It is a great tool to gauge customer and employee responses to products and/ or services; it’s also a great way to keep tabs on the positive and negative publicity generated by the media. Online reputation management is the future of marketing. Are you taking full advantage of social media platforms to boost your and your company’s reputation? Like any marketing technique, the key to building a strong “personal” brand is to begin with a core strategy that works in line with the larger goals for your career, leadership, and/ or business. Spidermode can help get you started on the right track with a social leadership and content strategy customized to your career and business needs. Sign up today for a free consultation on social leadership. How are you using social leadership to boost your reputation and brand image? Share your insights by liking, commenting, and sharing this article. I appreciate your feedback. Seasoned entrepreneur/business leader with over 17 years of experience in building and managing successful companies in India and the U.S. I’ve learned many lessons from the successes and failures that I’ve experienced. I enjoy sharing what I’ve learned with other entrepreneurs and business leaders as a partner, investor, advisor, consultant, board member, or invited speaker. over 10,000 entrepreneurs, business leaders and managers. ©2015 SpiderMode. All Rights Reserved.